"We started discussing the setting and what we wanted to do even before we were finished with Syndicate," Odyssey's creative director Marc-Alexis Côté tells me. It's a couple of weeks before E3 and I'm speaking to Côté at an event in Paris, attended by numerous developers from Odyssey's lead studio, Ubisoft Quebec. This is the team behind the London-based Assassin's Creed Syndicate, the enjoyable 2015 entry which released while the future of the franchise post-Unity was being quietly reworked behind the scenes. "Together with the Origins team [at Ubisoft Montreal] we've been busy plotting the course of the franchise, from action adventure to a full-fledged RPG as something to happen over these two games," he continues. When introducing Odyssey, Côté boasts that it "completes the transition" of the franchise into a "full-scale open world RPG". Where the team behind Bayek focused on rebooting the series' combat, navigation and sense of space, Côté and co. have focused on improving the series' storytelling so you can "finally interact with history". As in the full game, my demo - the same on offer this week here at E3 - begins with the choice of Alexios or Kassandra as a playable character. They are individuals - not male or female versions of the same person, or your own avatar - but you can expect the same script for them both. It's 431BC in Ancient Greece, 400 years before Assassin's Creed Origins. Sparta and Athens are at war, and it's been about 50 years since the Gerard Butler's King Leonidas fought the famous battle in the movie 300. Your player character is a forgotten descendant of Leonidas, kicked off a cliff at a young age for having done something which brought great shame on your family. 17 in-game years later and about the same number of hours into the game's story, the demo opens with you well on the path to becoming a mercenary of renown. I was given free reign to explore a pair of islands within the Greek archipelago, Mykonos and Delos, whose geography was familiar from Origins - settlements, shops, forts, treasures, and high-up sync points to climb and unlock fast travel. As with Origins, you can again scope out the lay of the land using your eagle, this time named Ikarus. As with Black Flag and Rogue, you can also once again sail your dedicated ship. After taking a backseat in Origins, the series' fan-favourite naval gameplay allows you to sail, fight and board enemy ships using an upgradable vessel, strengthened by a recruitable crew. Rocking up with your friend Socrates, because of course, you are directed to the main questline of these two islands, which involves dictatorial ruler Podarkes and the rebel effort to oust him, led by a couple: Kyra and Thaletas. I quickly befriended Kyra through the game's new dialogue options - a first for the series - which show off a sharper overall script. Early on in the questline, dialogue choices mainly comprise you choosing to find out more detail on the local conflict and characters. Alternatively, you can leap straight into the action, taking out forts or destroying resources to weaken Podarkes' overall strength level. He exists as a roaming figure on the map you can tackle at any time, but by neutralising his support around the islands you can lower the difficulty of the final encounter. In some occasions, dialogue lets you perform a clearly-marked option to influence the conversation a certain way (to lie, or charm) and if this is beginning to sound a little Mass Effect, then you'll be pleased to know you can indeed romance many characters throughout the game - and do so regardless of the character you chose to play as. Fast forward three hours and Kyra and I are now close friends. We've attacked Podarkes' troops, gone hunting together and are now sharing a moment on a beach. Should she tell Thaletas about us, she wonders? Perhaps, but maybe later, I choose. I wonder how this scene would have played out - or existed at all - if we hadn't flirted before. A final detour, a seemingly innocuous side-mission I've left on the map for a while, offers a big plot revelation about evil Podarkes and his relationship to Kyra. I'm lead to confront Kyra with what I've discovered and again choose what happens next. The order I've played these missions, leaving this one last, just about works - it certainly provides an interesting twist now my relationship with Kyra has already reached a certain point. And then it's off to the final showdown. Is this the first AC game without an Assassin star? So you do become an Assassin? Is there a hidden blade? A menu screen where you control your character? Do you explain how you control your eagle? Yes. Well. The connection between the eagle and the player character is something which will be revealed in the game. It's not a yes or no. The Black Market, does that work the same as the Heka chests from Origins? It's an evolution of that system. Cosmetics you can also acquire through gameplay? Can you change your hair or beard? Are there cats to stroke? No. But you can equip a hood if you want to. I've learned from my Twitter feed it's very important for players! Along the way I've undertaken a naval battle, blasting away enemy ships parked in the bay between the islands, and fought in a giant 150 vs. 150 war battle. This latter mode, new to the series, uses 300 (no coincidence, I'm sure) characters on screen to illustrate the ongoing Peloponnesian War between Athens and Sparta which underpins a lot of Odyssey's big picture storyline. It's a fun way to mess about with some of the game's new combat mechanics in a high-intensity setting, whittling down an overall meter of the opposing army's strength before they do the same to you. Origins' hit-box based combat returns in Odyssey with a new range of special moves and an ability bar which fills as you defeat enemies and successfully dodge attacks. 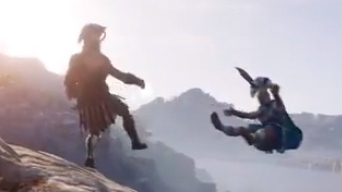 These new special moves include Leonidas' famous Spartan kick - it obviously runs in the family - which you can use to hoof enemies off cliffs or simply clear a bit of space around you if things are getting too hectic. There are special abilities for your bow, such as to call in a rain of arrows. You can gain stealth for a limited period of time, and rush an enemy to get the first strike. Your bow can now equip multiple types of arrows, too (fire type was the only one on offer here). I completed every mission in the demo and was then at a level equal to Podarkes, so the final battle against him therefore went fairly smoothly, with him robbed of much of his defensive garrison. I've lowered public opinion to him, too, so when I find him he's actually been set upon by a passing NPC. And then it's over, and it's back to my rebel friends Kyra and Thaletas for a victory party. Except, it's not - those choices I've been making throughout three hours of quests on these islands have finally kicked in, and those same friends are paying the price. The information on Podarkes I shared with Kyra, my decision to hide our romance from Thaletas, and the subsequent conversations these resulted in have cascaded into an unexpected conclusion which left me sailing away haunted by how things wound up. "I lived through the same experience," Côté relates to me, later. "I thought I was really good, but that happened... I went to see the writers! They told me, 'do you realise what you did, twice, during your answers? You double confirmed that [spoiler] through the dialogue tree. You told her to..." I'm genuinely a little upset to hear how things could have played differently - but am relieved to find out Odyssey is getting a proper RPG-style save system so I will be able to dip back in and explore alternative outcomes. "A lot of those islands have those self-contained stories," Côté adds. "Every island has its own self-contained adventure with its own town and story." As for romanceable characters, you can expect them to work throughout as in other traditional RPGs, too. "Sometimes you've got that ability [to go back and visit], sometimes you can bring them on your boat as a lieutenant." This focus on story - there are 30 hours of dialogue, Côté tells me - is the core of Odyssey, a game designed to tell an "epic Greek tragedy", but large enough to tell smaller stories too, reflecting the period's own obsession with dramatic comedies and legends. It's also a choice born out of a freedom from many of the series' long-held linchpins. "The player fantasy is not to become an Assassin but to be a mercenary and become a legendary Greek hero," Côté says. "We play with the themes of the franchise - but it's not the hood, it's not the blade. It's about a pivotal moment in history." (Your hidden blade, this time around, is actually the broken tip of Leonidas' spear, an object bestowed with First Civilisation powers.) As for how the game connects to the wider Assassin's Creed storyline, well, the enemy faction in the game is the Cult of Kosmos which appears to a precursor to Origins' mysterious Order of Ancients. Odyssey will also continue Origins' ongoing modern day plotline with Layla, the playable character last seen meeting up with a notable Assassin in the present day. Series fans will not be disappointed, Côté concludes. "You'll see us explore the First Civilisation more, a lot more than we've ever done," he teases. As you're not playing an Assassin, you will no longer be desynchronised if you kill civilians. But you will be penalised, in the form of a notoriety system which will attract nearby mercenaries to hunt you down. These are the roaming Phylakitai from Origins, now with procedurally-generated reinforcements who will turn up to cut you down to size if you gain too much of a bad reputation. Even stealing from neutral NPCs will get you noticed. Up to 50 of these mercenaries can roam the map at any time, some sent after you at certain points in the story, others generated if you choose to take more of them on - with the ability to rank yourself against the other mercenaries in the world. It's one of several new RPG layers which have been added to the world, alongside the upgrading of your boat (you can choose to spare defeated mercenaries and add them to your crew) and a new Peloponnesian War System which responds to your influence over the game's entire map, and lets you turn the conflict's tide towards either Athens or Sparta. Details of that, specifically, remain under wraps. When back at the drawing board for Assassin's Creed's future, Ubisoft's Montreal and Quebec teams plotted how the series might change by applying a theory of Autonomy, Relatedness, and Competence to the game. The values derive from a philosophic idea of what guides self-determination. "The theory goes that by improving those factors you will foster greater player engagement, people will spend a longer amount of time in-game, enjoy their time more, and this goes hand-in-hand very well with the principles of an RPG," Côté says. "Origins was very good at Competency because of its progression, but how can we make you Relate better? It comes with player choice - choosing your character, choosing how you role-play through dialogue choices." Autonomy, meanwhile, is being worked on via the ancillary naval, war and mercenary rank systems. After three hours play, it's easy to look back on Origins and see it as the stepping stone it was to get here. After three hours play, it is obvious the labours behind Odyssey amount to much more than another 12 months work.